The British Geophysical Association is a Joint Association of the Geological Society of London and the Royal Astronomical Society. Its aims are to promote the subject of geophysics, and to strengthen the relationship between geophysics and the other natural sciences in the UK. Membership of the BGA is open to Fellows of either of the parent Societies. The Geological Society of London was founded in 1807, and is the UK national society for geoscience. The Royal Astronomical Society (RAS) was founded in 1820, and promotes the study of astronomy, solar-system science, geophysics and closely related branches of science. Both societies have a long history of sponsoring meetings and publishing research on topics such as earthquakes, and the Earth’s gravity and magnetic fields. Despite the BGA’s association with the oldest geological and astronomical societies in the world, it has had a relatively short history. 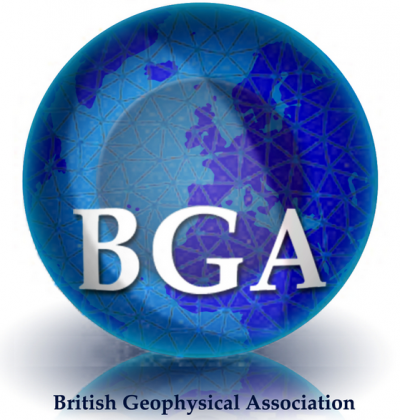 The BGA was formed in 1980 but was originally called the Joint Association for Geophysics (JAG); the name British Geophysical Association was adopted in 1997 and the current BGA logo was designed in 2010. The BGA serves as a focal point for geophysics in the UK by sponsoring meetings and encouraging the publication of research results as well as through representation on national committees and the preparation of consultation documents. The BGA is managed by a committee consisting of fourteen members. There are normally eight directly elected members: a President, Secretary, Treasurer, Meetings Secretary, Education Secretary and three other members, including Social Media and Outreach Officers. The Committee includes one member (normally a Council member) appointed by each of the parent Societies to provide a channel of communication between the parent Societies and the BGA. A Schools representative and an Industry representative may be co-opted onto the Committee; these persons need not be Fellows of either Society. In addition, two further members may be co-opted as required; these persons need not be Fellows of either Society. Each year the BGA awards the Bullerwell lecture to an outstanding young UK geophysicist. This lecture is currently given as a keynote talk at the European Geophysical Union meeting, held each spring in Vienna. The lecture is also given later in the year at the BGA Postgraduate meeting. Alan Douglas and Dan McKenzie were the first recipients of the award in 1981 and 1982, respectively. William Bullerwell (1916-1977) was the first head of the Geophysics Unit in the British Geological Survey, later becoming the Chief Geophysicist of the organisation. The award recognizes his contributions to pure and applied geophysical investigations, particularly in relation to the UK and the surrounding continental shelf. The association also sponsors the yearly New Advances in Geophysics (NAG) meeting, which is normally held in Burlington House in London. Past meeting have included ‘Controlling factors of subduction zone earthquakes’ and ‘Geophysics and global climate change’. The BGA Postgraduate Research in Progress Meeting is normally held in September and brings together research students from the UK and other countries. Postgraduates each year from a different institution host and organize the meeting. It is designed as an opportunity for young geophysicists to present their current research in a relaxed environment to an audience of their peers. Additionally, in response to written requests, the BGA sponsors a number of specialist meetings (see our Meetings Portal). The BGA has an active “political” voice, regularly contributing consultation documents on geophysical subjects to national enquiries and committees. A recent example is the Higher Education Funding Council for England (HEFCE) consultation on the proposed Research Excellence Framework, where the BGA nominated a number of panel members. It also regularly provides feedback to enquiries from the House of Commons Science and Technology Committee’s. Recent consultation documents include the effects of cuts on science and the regulation of geo-engineering. The BGA attaches great importance to the promotion of geophysics at the school and university level. Although the term ‘geophysics’ is not widely used by the general public, there is a keen awareness and interest in topics such as earthquakes, volcanoes and natural resources. Such subjects engage young minds, but there is a general misunderstanding that the best preparation for studying such topics lies in geology or even geography courses at the high school level, when in fact physics and mathematics are the best preparatory courses. The BGA is currently working with the Institute of Physics in an effort to get more geophysics into the A-level physics curriculum. Once at university, geophysicists go on to develop a broad range of strengths in subjects including pure physics, mathematics, numerical methods, computing and geology. Consequently, there is a rich supply of career options open to graduate geophysicists. In 2006, the BGA commissioned a survey of the state of geophysics in the UK. The review was under the Chairmanship of Professor Aftab Khan (University of Leicester). The Khan report illustrated that the widespread ignorance of geophysics as a subject was partly responsible for the low take up of university geophysics courses. In an effort to address this, the BGA helps administer the School Seismometer Project, which is programme organised by the British Geological Survey. Generous funding from the PESGB’s (Petroleum Exploration Society of Great Britain) Geoscience Schools Outreach Fund is used to buy seismometers for secondary schools and to help train Physics teachers how to use them. The Khan report also went on to note that the skills base in the UK, developed through university degrees in geophysics since the 1960s and 70s, has significantly contributed to the wealth of the nation (through exploration and exploitation of natural resources) as well as to national environmental concerns, safety, and security. Development of programmes that will impart geophysical knowledge and skills to the next generation are vital for our future needs. The growing demands of industry and government service are facing a severe shortage of trained UK graduates with geophysics skills. The future is bright for Geophysics. The exploration of our planet and solar system will continue to capture the imagination of young scientists, as will the study of natural phenomena such as earthquakes and volcanoes. Geophysics will play a central role in environmental issues. Waste management of all types is an important societal issue: the storage of carbon dioxide and radioactive waste in geological formations has to be monitored and managed. Natural hazards will threaten more and more people as countries develop – geophysical investigations and monitoring are key to understanding and mitigating the associated threats. Geophysicists with a broad range of backgrounds will be needed to explore and address a wide range of research topics and contemporary scientific issues.